Logie, John. Peers, Pirates, and Persuasion : Rhetoric in the Peer-to-Peer Debates. Parlor Press, 2006. Print. Early on L. notes that this book will consider the anti-piracy arguments of the content industry by analyzing the key terms and metaphors that underpin their claims (6). In addition, L. claims that he will “interrogate peer-to-peer enthusiasts’ various responses to these arguments, and the limited applicability of this community’s favored metaphors and models” (ibid.). Specifically, L. hopes to demonstrate how the content industry’s arguments have been effective in affecting legislation but their efforts have largely failed in the court of public opinion. L. notes that the Basic Books v. Kinko’s court decision – and other court cases since – has eroded the opportunities for public access and fair use in academic environments (16). L. goes on to note that he believes that the U.S. has lost the balance that the original copyright policy decreed – a protection of both public and private interests. L. pays attention to 5 terms in the p2p debates that have been used to alter the technologies and social behaviors they supposedly describe. The terms include hacking, theft, piracy, sharing, and war. Aim of chapter: use Mailloux’s rhetorical hermeneutics to interrogate the term “hacker” to reveal how different, often competing, social forces have shaped the meaning of the term (22). L. turns to Burkean identification as a way to understand the public role that Fanning played in the public persona of Napster as underground/rebel, youth organization/platform. This is much the same kind of work that Thomas Frank did in his time during the 1990s criticizing the corporatized culture of publications like Wired through writings published in The Baffler. This position led Napster in a unfavorable (to business) direction as it limited the opportunities and positions that Napster could take as a legit organization (43). 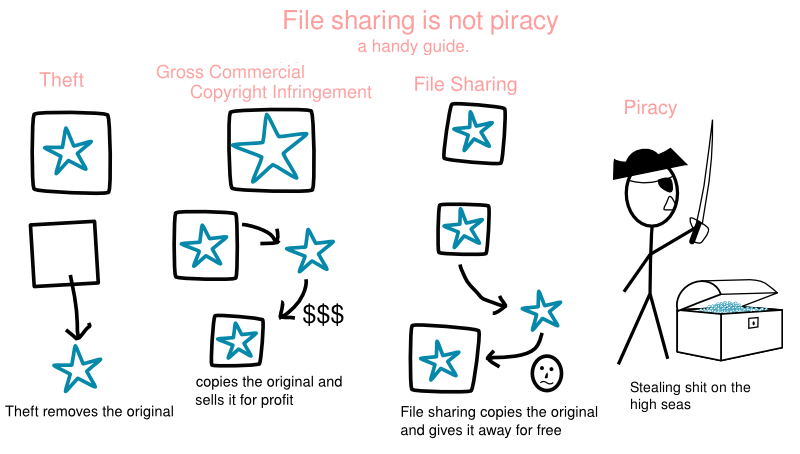 The three interlocking concepts that function to support copyright as doctrine in the analog world (from Patterson): 1) A copyright owner has a right against an economic competitor to the exclusive reproduction in its original and derivative form; 2) An author retains an inalienable right to protect the integrity of his work, and his reputation in connection therewith; 3) The right of individuals to the use of copyrighted work for personal, private, or reasonable uses shall not be impaired (Patterson 228, L. 45). L. draws attention to the public ceding of copyright to creators by highlighting how Congress (not God or anyone else) grants copyright. . . and Congress is simply a manifestation of the will of the people (supposedly). He then goes on to demonstrate how this breaks from moral rights and how this right of the public has been eroded away by various acts of Congress like the Sonny Bono act, the NET Act, and DMCA . . . and in the process the use of copyrighted material without permission has been redefined (regardless of fair use) as theft. L. notes that “the mere act of reproducing copyrighted material or of securing copies of copyrighted material via p2p networks ought not, in and of itself, be regarded as the equivalent of theft” (50). He then explains his position with a consideration of fair use. The reification of p2p transfers as theft was supported by artists equivalence between physical theft and digital downloading (54). This is an intense and effective use of pathos. Key case against the “sweat of the brow” doctrine: Feist v. Rural Telephone Service. L. points out that despite court cases that outlawed any infringement, the Betamax case was a clear example of the legality of copy-making in analog environments (57). This pointed out that infringing technologies aren’t inherently illegal (or weren’t until Napster); however, since the Napster flap the technologies – not the reproductions and sharing – have been outlawed. This poses some scary possibilities/scenarios for the regulation of technology. In this chapter L. considers how the metaphor of piracy equates the digital sharing of information over networks to an outlawed, violent practice associated with the counterfeiting industries and murderous privateers. L. notes that there is a moral argument made for piracy: “The most common argument in favor of piracy is that the copyright holders have not taken into account the realities of local economies and that their products would be wholly unavailable were it not for piracy” (71). L. goes over the history of the my.mp3.com case to demonstrate how this particular legal interpretation of infringement went against two centuries worth of IP law that recognized the public’s access to reasonable use of information (82). L. argues (via Litman) that this case also let technological innovators move away from legal development of music services (and other digital formats of media) because it effectively litigated my.mp3.com out of business – punishing innovation and the intent of the creators to conform to copyright in a new, emergent digital environment (82). L. uses Rebecca Moore Howard to argue that the use of other’s work is fundamental to the creation of new work (83) and, as such, should reform the content industry’s perception/articulation/propaganda about what constitutes sharing as piracy. L. notes that the notion of “sharing” in digital environments is also founded on an error: you don’t deplete a resource when you share it digitally; rather, you actually create more for that resource. Relying on Lessig’s notion of rivalrous (physical natural resources) and non-rivalrous resources (ideas, music, expressions) , L. notes that a legal system that applies the same standards to both is actually dangerous because it imposes counterproductive systems of control (85). L. points out that the prosecution of uploaders, not downloaders, is a strategic move by the MAFIAA as the Betamax case and others have made clear that making copies isn’t the problem; rather, distributing those copies is. Yet, as L. notes, the networks that sustain p2p sharing depend on the process of sharing (and the concomitant creation of community). L. notes that one positive outcome of the KaZaa case is an increased, heightened awareness of users to the intricacies of the technology they are using (99). This is certainly played out in private bittorrent communities whose users require a particular literacy to participate and, therefore, operate in the gray areas of the law. L. comes down hard on p2p networks at the end of this chapter by highlighting how they aren’t really “communities” (unlike bittorrent). He notes that, “At present, however, the bulk of the Internet-based distribution of mp3 files occurs anonymously, with no interaction of conversation between the people whose computers are engaging in p2p transfers. There are many terms we might use to fairly and accurately describe these distributions. ‘Sharing’ ought not be among them” (104). This is remarkably different from the communities that you study. 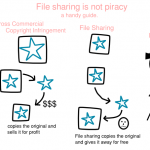 P2P technologies as war is the logical conclusion of the rhetorical reframing from hacking to sharing to theft to piracy (105). The goal of this chapter is to consider how the discourse of p2p transfers has been reframes as a scene with home troops and enemy combatants (107). To do so, L. employs the ancient rhetorical tactic of stasis theory (questions of fact or conjecture first, questions of definition in the second, questions of quality in the third) in order to demonstrate how the war metaphor for p2p sharing has taken hold. L. spends a good deal of time considering the Cold War and the Cuban Missile Crisis as the war metaphor equivalents of the Naptster-RIAA dispute in the early 2000s and beyond. L. notes that the p2p debates are stalled around the second stasis or the question of definition. This is because the individuals on both sides are unwilling to recognize the definition of what constitutes (il)legal sharing in digitally networked environments (and, hence, the work of Logie’s book). This along with other impasses is what L. sees as the central problem in resolving the debate or coming to consensus. As he notes, “The path to fair and appropriate policies addressing p2p technologies continues to be obscured by the polarizing rhetoric often used by the participants in the debate” (125). L. notes that the unfortunate association with p2p technologies and social production on the internet with criminality is frightening . . . especially in light of the possibilities offered by Open Access initiatives and the free journal movement in academia (and for various reasons beyond) (127). This is especially apparent when you consider how the internet itself is (as the MGM v. Grokster scientists argued) a p2p environment (especially in light of Web2.0 technologies). L. notes that “the cat is out of the bag” in some senses as technologies will continue to evolve . . whether the content industries, state legislatures, and formal entities are on board or not. L. then turns to rhetoric and composition’s critique of the solitary author (Lunsford, Ede, Woodmansee, etc.) as a resource to combat the increasing turn toward copyright as hindrance to creativity and innovation. He draws attention to the fact that the composition class is a site of enculturation into IP and urges Writing Studies scholars to take their role as IP educators seriously in order to ensure a balance between the interests of the public and the interests of the private/commercial. L. worries (because of the MGM v. Grokster case) that the monitoring of technological development and innovation – and its curtailment – is a serious threat to the future of the digital sphere, the digital commons, and the public interest at large as it assigns too much control to corporate interests working through the guise of the state. As he notes, “Grokster thus represents the culmination of a series of incremental steps in which copyright jurisprudence has moved away from a focus on the tangible effects of infringement and toward assessments of whether the developers of a particular information technology or software system adequately addressed the possibility that their products might be used not only for duplication but also for infringement” (140). L. ends with considering eBooks and the potential they could offer for the process of research and publishing. He uses this example as a way to highlight how the technology to allow social production via sharing is there but is controlled to the point of being irrelevant in order to protect content industry secured IP.